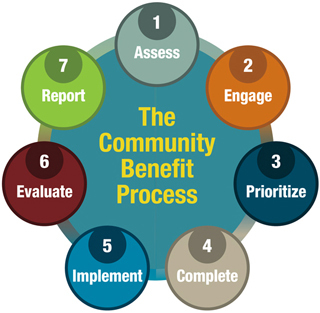 A hospital’s “Implementation Strategy” is a written plan that addresses the selected community health needs identified in a Community Health Needs Assessment (CHNA). The Implementation Strategy is considered complete after it is approved by the hospital’s authorized governing body to act on its behalf as permitted by state law (e.g., board of directors or trustees, committee of the governing body or others). The final IRS rules on CHNAs allow for the Implementation Strategy to be approved on or before the 15th day of the fifth month after the end of the taxable year in which the CHNA was conducted. A copy of the Implementation Strategy must be attached to Form 990 Schedule H, or the URL where it is posted must be included. Describe the health needs the hospital will address. The Implementation Strategy is not limited to address only those health needs identified in the CHNA. It also may describe activities to address health needs the hospital identified in other ways. Describe the hospital’s plans to meet a significant health need by identifying the resources the hospital will commit to meeting the health need. Identify the anticipated impact of those resources on the health need. Implementation Strategies can be developed in collaboration with other organizations, with all participating organizations identified in the report. Describe any planned collaboration with government, nonprofit or other health care organizations, including related organizations in meeting the health need. The Implementation Strategy will also identify the health needs the hospital does not intend to address. For health needs the hospital will not address, describe why the hospital will not do so (i.e., community organizations more qualified, lack of expertise or resources, low priority). Note: While there is no specific IRS guidance on the process of obtaining public comment on the Implementation Strategy (other than including it in Form 990 filings), the IRS guidance does require input from the public. The guidance notes that hospitals should include written comments on the most recently conducted CHNA and Implementation Strategy. To comply with this requirement a hospital may wish to develop a process to obtain public comment on the Implementation Strategy. Download a PDF sample of the Implementation Strategy Checklist here. Implementation Strategies can be developed in collaboration with other hospitals, agencies or health departments. Each hospital must document its Implementation Strategy in a separate written plan, taking into account its specific programs and resources. A hospital that adopts a joint CHNA report in partnership with another facility may also adopt a joint Implementation Strategy. The joint Implementation Strategy must describe how one or more of the collaborating hospitals or organizations plan to address each identified health need, or will not be addressing a health need, and explains why it will not be addressed. To meet the requirements of completing a joint Implementation Strategy, the document must clearly identify that it applies to the hospital. It must identify the hospital’s particular role and responsibilities in the Implementation Strategy, and describe the programs and resources the hospital plans to use to address the priority health needs. A joint Implementation Strategy must include a summary or other tool that helps the reader easily locate the portions of the plan that relate to the hospital.